This is a family recipe from my mother Jean Van Willigen. It seemed to have originated in a German restaurant in Watertown, Wisconsin where an aunt’s father- in-law was the cook. His name was Billy Schubert. In a large kettle combine all ingredients except the bacon. Bring to a boil over moderate heat, stirring occasionally. 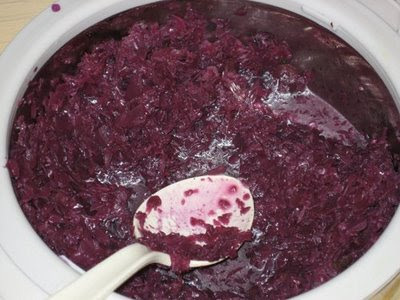 Reduce heat: simmer covered and stirring occasionally for 1 to 1 1/4 hours until liquid is reduced and cabbage is tender. Thicken at the end with a bit of flour. Fry the bacon crisp and crumble as a topping if you choose. The recipe does well prepared ahead and can be served the next day. I use a food processor for all the chopping.